I have been asked to provide a digested version of this important blog piece for all parents who are interested in understanding where NY public education is heading. I realize the piece is long, but it was important to cite facts and evidence (consider it common core aligned ;-). This is NOT rocket science you don’t need a translator to get through it all – all you have to do is just connect the dots to understand that NYS officials have been setting the stage for a shift from traditional learning to Competency Based Education and Computer Based Technology to replace teachers and real learning in our classrooms. So, what does Governor Cuomo and NYS have in store for public school children? -a phase out of teaching and learning to be replaced by technology instead of live instruction. Questar Assessments, a computer based tech testing company hired by NYSED last Spring, fits perfectly into the “master” plan. “First, eliminate the one-to-many teaching approach. Students can’t receive personalized instruction and personalized learning when a teacher has to teach to the most common denominator. We can solve this problem with technology by giving every student a tablet device that wirelessly connects to adaptive software in the cloud — and treat them as the students’ own, personal whiteboards, with lesson plans that target their level of mastery; instruction tailored to their individual learning styles and capability levels; and learning modules presented just to them. A single assessment when students first enter the school, regardless of their age, would easily determine at what level of instruction these on-the-tablet lessons would begin. Second, seamlessly integrate assessment with the instruction presented to each student on his or her tablet. Educators know that best-practice teaching involves instructing for five minutes, asking students a few questions to determine if they’ve understood the material, backtracking if necessary, and then moving on to the next topic. Yet most teachers don’t teach this way for two reasons: pedagogical momentum and a lack of technology that integrates instruction and assessment seamlessly so it doesn’t disrupt the flow of the class. With tablets and the right software, this approach is possible on an individualized basis: after every five minutes of individualized tablet-based instruction, students would be presented with a brief series of questions that adapt to their skill level, much as computer-adaptive tests operate today. After that assessment, the next set of instructional material would be customized according to these results. If a student needs to relearn some material, the software automatically adjusts and creates a custom learning plan on the fly. The student would then be reassessed and the cycle would continue. With both the instruction and the assessments integrated into the same software and presented as a continuous “flow” to each student, THERE IS ALMOST NO DIFFERENCE BETWEEN INSTRUCTION AND ASSESSMENT IN THE MIND OF A CHILD. Third, assuming that all instructional material and formative assessments are aligned to achievement standards, there is no longer a need for students to take standard end-of-chapter tests. The formative assessments that are interwoven with their instructional materials provide sufficient data for teachers to gauge student progress through, and mastery of, each topic. Furthermore, these results are available in real time throughout the day and across days and weeks. In reality, there would be little need for interim progress reporting, since the software would reteach topics as needed to ensure full and complete mastery of subjects. However, it would be useful for teachers to know if students are falling behind significantly so they can take alternative remedial steps. Given this model, there is also the logical conclusion that real time data, when aggregated across an entire district, can also reduce or eliminate the need for district benchmark tests. There is no need for interim benchmark tests if an administrator can see, in real time, the aggregate and disaggregated performance of students across the district and their predicted performance on end-of-year summative assessments. Fourth, eliminate grade levels. Because students progress through subject material at their own pace, they can be grouped by ability instead of grade level, similar to competency-based learning approaches currently being tried in various schools and districts. In this idealized model, grouping students by ability supports the project-based learning that is a key component to academic and social development and is used to complement the individualized learning plan provided by students’ tablets. It would be naïve to think that such a holistic change to classroom structure and pedagogy would be easy. A number of significant funding, process, training, and political challenges would need to be addressed. But embracing a holistic change instead of trying to fit individual improvements within the current classroom structure offers us our best opportunity for true, impactful change in the learning environment. To paraphrase Tim Cook, CEO of Apple, we must be “willing to lose sight of the shore” and make uncomfortable changes to make a significant leap forward in education”. All this begs the question, are NYS officials really listening to opt out parents or just barreling forward with the common core plan? Technology to replace teachers? Do we want our kids sitting at computers all day and being tested every 5 minutes via embedded assessments? NYS is and has been developing a switch to CBE right under our very noses. Once you connect the dots , its very easy to see the big picture. Pay attention parents and teachers – do not be fooled. Stay vigilant, we must resist the changes being forced on our children and hold public officials accountable for these bad decisions. Please read the SOTHVNY piece below in full to connect the dots yourself. Please be advised, the National Governor’s Association recently issued an advisory that expressly urges state leaders to adopt and implement Competency Based Education measures in order to augment Common Core. individuals have a greater potential to be productive members of society who better use taxpayer money by staying in the education system only for as long as necessary to meet their professional goals. Despite the appeal of CBE and its potential benefits, the structure does not fit within society’s current entrenched vision of education and existing policies. Governors who seek to move their states toward a CBE system should consider several policy changes to overcome the barriers embedded in the current system. In a CBE program, the role of the educator and how he or she delivers the content can look different from current practice. Educators must be able to guide learning in a variety of ways, not simply supply content. Changing the role of the teacher has significant implications for teacher-preparation programs, certification, professional development, labor contracts, and evaluation. Computer-based learning is likely to be even more important in a CBE system than in the current time-based system. In addition, robust assessment is a key element of CBE, designed to facilitate more flexible and better testing of students’ learning. Assessment is frequently tied to accountability in K-12; therefore, policymakers might have to reconsider what they want their accountability systems to measure. To deliver high-quality instruction in a CBE model, educators require access to assessments that measure learning progress along the way so that they can modify their teaching based on each student’s progress toward mastering the desired content and skills. To draw on the power of those assessments in a CBE system, assessments should be offered on a flexible timeline instead of during one window at the end of the semester or school year. No state has yet figured out how to make the switch to such a model at the K-12 level, but New Hampshire is working toward that goal. The Obama administration also just issued a Testing Action Plan that it says should help reduce over-testing in public schools. That plan includes a cap of 2 percent on the classroom time students spend on mandated standardized tests. Time-limited: While it is up to states and districts how to balance instructional time and the need for high-quality assessments, we recommend that states place a cap on the percentage of instructional time students spend taking required statewide standardized assessments to ensure that no child spends more than 2 percent of her classroom time taking these tests. Parents should receive formal notification if their child’s school exceeds this cap and an action plan should be publicly posted to describe the steps the state will take to review and eliminate unnecessary assessments, and come into compliance. States and school districts should carefully consider whether each assessment serves a unique, essential role in ensuring that students are learning. New York has worked to limit the amount of time students spend on required state- and district-level standardized tests – no more than 1 percent of instructional time for state-required standardized tests, and 1 percent for locally required standardized tests. To support this work, New York also established a “Teaching is the Core” competitive grant which supported teams of administrators and teachers in reviewing all assessments given, eliminating unnecessary ones, and improving the quality of assessments by making them more performance-based. Providing flexibility for innovative assessment practices: The Administration will invite states that wish to request waivers of federal rules that stand in the way of innovative approaches to testing to work with the Department to promote high-quality, comparable, statewide measures. 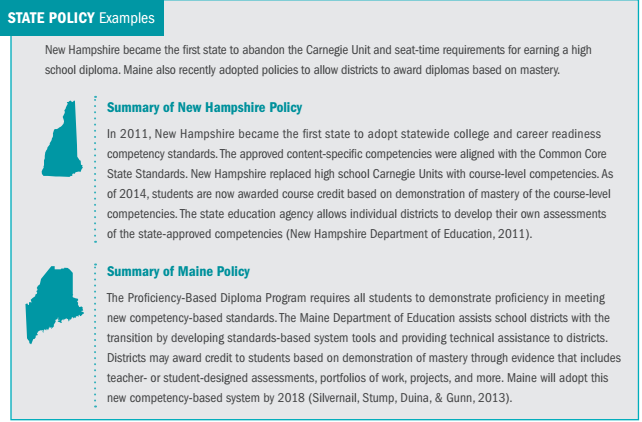 For example, the Department granted a temporary waiver to New Hampshire to pilot a competency-based assessment system in four districts. This flexibility allowed the state to give students locally developed tests – in lieu of the statewide standardized test – that will assess students’ progress based on their ability to apply what they know through a series of complex, multi-part tasks. This flexibility was accompanied by a commitment to continue to report results to parents for every student in the state and to transition back to a single statewide measure of student learning against academic standards once the pilot is complete. It should be noted, according to a blogger named Education Alchemy, CBE is part of an agenda that goes well beyond “reducing” testing time for students. “Common Core was, and is, an agenda crafted by the American Legislative Exchange Council (ALEC). It was never about “communism,” or “socialism.” It was the state and federal governments serving as the delivery boys for the privatization of public education at the hands of global corporate interests (think: Trans Pacific Partnership). Outsourcing K-12 education, eliminating teachers (union busting), eliminating Colleges of Education, data mining, creating for-profit alternative certification programs, and outsourcing teacher preparation to online corporations. 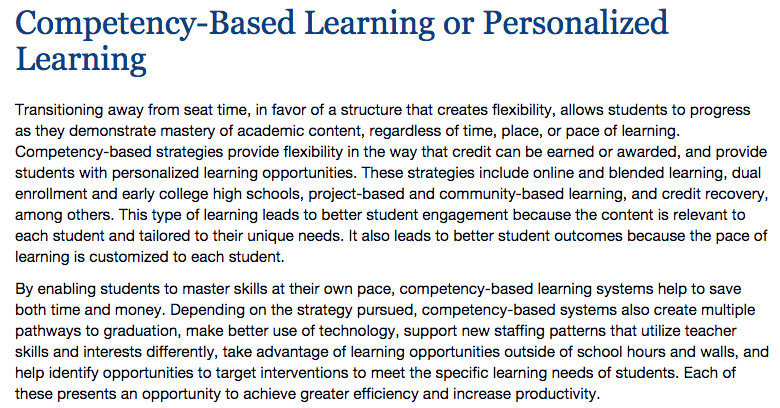 How: 1) Create a set of “common”standards, 2) break standards down into modules called student learning outcomes (SLO’s), 3) use SLO’s to manufacture Competency-Based Education (CBE) framework, which..4) can be provided by private/corporate entities via online education and technology-driven resources (no classroom or teacher…or school, required). 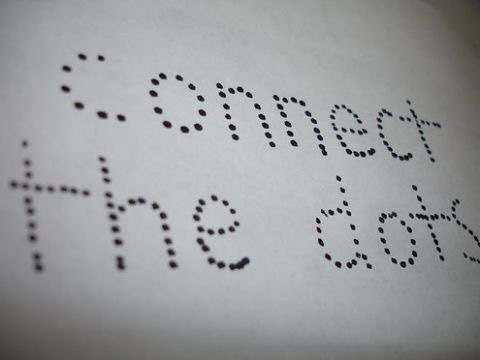 If you have not already done so, please read the two blog pieces I mentioned by Education Alchemy as they provide the backstory regarding Common Core, ALEC, privatization agenda and connects the dots to CBE and beyond. But, I digress. The news coming down from the White House compounded by the National Governor’s Association report raises many questions about the trajectory of education policy in New York State. What does Cuomo’s Common Core Commission have planned for New York State public school children? Are the Commission members genuine about listening to parents and educators willing to “fix” Common Core, or are they just fronting and going through the motions in order to conjure up legislation to further the next steps of the Common Core agenda? Could the NYS Commission simply be going through the motions? Is Cuomo planning to “overhaul” education policy in New York State in order to “unleash the Common Core’s full potential” via a Competency Based Education model? Was CBE the Common Core plan all along? This post will take things a few steps further by connecting the dots to demonstrate that New York State is already well on our way to implementing CBE in our public schools as a matter of policy. Indeed, for all intents and purposes, it is clear that NYS is moving toward adopting and implementing CBE and/or a variation thereof, through legislative, waiver and/or other measures at a rapid pace in our public schools state wide. Most educators agree that the current lecture-style approach to teaching is flawed. Almost all classrooms remain stuck in the same centuries-old paradigm of one-to-many instruction: a lone teacher lecturing to a classroom filled with 30 or more students. Admittedly, there are some benefits of the lecture paradigm — examples of which can be found in “Study and Analysis of Lecture Model of Teaching”. In general, though, this approach limits the teacher’s ability to adapt his or her classroom to meet a number of 21st century teaching needs such as individualized and personalized instruction, personalized learning, competency-based grouping and progression, seamless blending of instruction and assessment, and timely impact of assessment results to affect instruction. While all of these best practices are widely thought to enhance student learning, individually they each present their own set of implementation challenges. And imagine the additional effort of having to fit any of them into today’s fixed-format classroom structure! It’s no surprise that there have been pockets of success in these areas but no widespread adoptions. 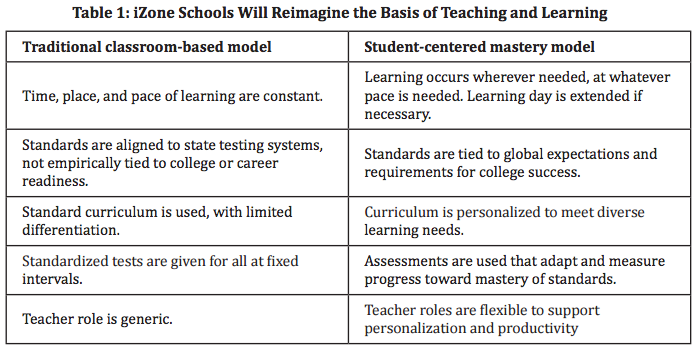 There are two key reasons each of these changes have been difficult to implement: first, they have been attempted within the current one-to-many teaching structure, and second, they have been attempted as individual initiatives instead of as a whole set of interdependent next-generation learning practices. Although it takes fortitude, grit and a lot of support, a wholesale implementation of these changes offers the best chance for a successful new paradigm. We need to reimagine the entire classroom model and address many of these needs at the same time so they become mutually-supporting components. First, eliminate the one-to-many teaching approach. Students can’t receive personalized instruction and personalized learning when a teacher has to teach to the most common denominator. We can solve this problem with technology by giving every student a tablet device that wirelessly connects to adaptive software in the cloud — and treat them as the students’ own, personal whiteboards, with lesson plans that target their level of mastery; instruction tailored to their individual learning styles and capability levels; and learning modules presented just to them. A single assessment when students first enter the school, regardless of their age, would easily determine at what level of instruction these on-the-tablet lessons would begin. Second, seamlessly integrate assessment with the instruction presented to each student on his or her tablet. Educators know that best-practice teaching involves instructing for five minutes, asking students a few questions to determine if they’ve understood the material, backtracking if necessary, and then moving on to the next topic. Yet most teachers don’t teach this way for two reasons: pedagogical momentum and a lack of technology that integrates instruction and assessment seamlessly so it doesn’t disrupt the flow of the class. With tablets and the right software, this approach is possible on an individualized basis: after every five minutes of individualized tablet-based instruction, students would be presented with a brief series of questions that adapt to their skill level, much as computer-adaptive tests operate today. After that assessment, the next set of instructional material would be customized according to these results. If a student needs to relearn some material, the software automatically adjusts and creates a custom learning plan on the fly. The student would then be reassessed and the cycle would continue. With both the instruction and the assessments integrated into the same software and presented as a continuous “flow” to each student, there is almost no difference between instruction and assessment in the mind of the child. It would be naïve to think that such a holistic change to classroom structure and pedagogy would be easy. A number of significant funding, process, training, and political challenges would need to be addressed. But embracing a holistic change instead of trying to fit individual improvements within the current classroom structure offers us our best opportunity for true, impactful change in the learning environment. To paraphrase Tim Cook, CEO of Apple, we must be “willing to lose sight of the shore” and make uncomfortable changes to make a significant leap forward in education. The Smart Bond will provide districts with what they need to meet the needs for innovation learning, which technology is a key component of CBE. Additional CEB dots are connected through Commissioner member Heather Buskirk, a Master Teacher who also happens to be a NY Ed Voice Fellow, a fact conveniently omitted from her Commission bio. She specializes and teaches in a PTECH school that boasts a project-based learning model, a key component of CBE. Her Superintedent Pat Michel boasts that he has managed to reduce special-education resources and costs via implementation of “Google Class Rooms” in stead of traditional learning environments also a key CBE component. In another vein, I note that Super Michel admits the Regional HS is “illegal”. While Michel claims that things are going very well in his Google school environment, to the contrary I have personally heard a number of reports from educators who feel that SPED students are not being provided the supports and resources that they need and are entitled to at Buskirk/Michel’s school due to the change from a traditional learning environment to a PBL/ Google based one. Whether this “Google class room” learning environment is working for disadvantaged/ELL/SPED students is arguable. Listen to Michel speak about the unconventional Google Class room starting at minute 19 to hear him “boast” of his success. 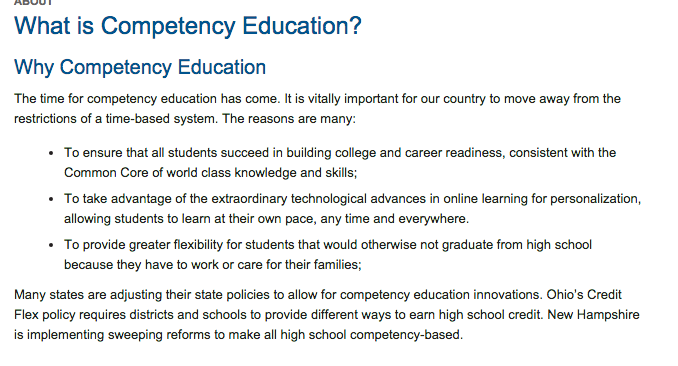 Moving on, a little about Competency Based Education measures. Competency-based education, also known as perfromance mastery, once designed as a whole child intitiative is now gaining traction among reformers who believe the measures can be implemented in economies of scale. It is also found in federal policy initiatives, like Race to the Top; in district innovation zones and turnaround schools; and in afterschool programs and expanded learning models and is known to be a reformer based initiative as a key component is data collection and testing. There are many facets to Competency Based Education, but this blog post will explore CBE and NYS’s readiness for such measures in the reformer context. NYSED has already admitted that they are NOT undertaking a major re-work of the standards despite the fact that the Governor, in stark contrast, claims that he will overhaul and reboot Common Core in New York State. With that admission in hand, it is more likely than not that changes to education policy will have to be done legislatively. I spoke to a high level and a low level official in Cuomo’s office. Both confirmed that Cuomo intended to make any changes to ed policy via “legislative” action as opposed to SED making changes at the Regents level. Althoug a slight nuance, CBE is most notably considered a legislative measure as opposed to a “policy” one. Indeed, CBE has been piloted and is already poised for development on a wide scale in New York State. Innovate NYC School projects supports schools by connecting educators and students, who understand school and classroom needs, with edtech companies who are developing innovative teaching and learning solutions. Innovate NYC Schools was established through the USDOE Investing in Innovation (i3) grant program to foster a thriving edtech ecosystem for NYC schools. Connecting the dots further, in August 2015, the North East Comprehensive Center/RMC conducted a study to examine how NYS could implement CBE in large scale. It should be noted the NECC consists of States: Connecticut, Maine, Massachusetts, New Hampshire, New York, Rhode Island and Vermont. with institutions of higher education and other relevant stakeholders for workforce opportunities using online and blended learning, and review of teaching and professional development policies and practices. Additionally, on December 17, 2014, the New York State Senate passed Bill 5509, which “Directs the commissioner of education to establish an online learning advisory council to make recommendations for establishment of a statewide online and blended learning program” in furtherance of the CBE agenda. increased access to AP courses and tests, the VAP program provides greater opportunities for lowincome students to demonstrate college- and career-readiness and mastery of the New York State Learning Standards. The program goals are to: enable larger and more diverse groups of students to participate and succeed in virtual learning AP programs and receive AP credits, provide enhanced professional development to teachers offering the courses, increase the number of virtual learning AP courses available to students statewide, and help build increased capacity at the district level to participate in available and expanding virtual learning opportunities. (http://www.p12.nysed.gov/part100/pages/1005.html#Credit). Move the tests online. Not many students write by hand anymore; it’s crazy to make them do it on a test. Make multiple testing windows available (e.g., 6-8 times annually) to support competency-based learning. Encourage the development of personalized and adaptive content with a prize aimed at advances in the most popular courses. Encourage the development of flex programs that expand access and support increased success (see When Glee Meets FIRST for Coffee and Leaves With an AA & 10 Reasons Every District Should Open a Flex School) by offering program leader bootcamps. Incorporate automated scoring to drive down test administration costs and improve the quality of performance tasks. With all of the colleges going bankrupt, College Board could buy one and offer credit directly. They could even offer an AA degree–making it a massive online early college program available (one way or another) to almost every student in the US. • Provide administrators within Local Education Agencies (LEAs) a powerful tool for evaluating virtual programs to ensure high quality and rigor in virtual programs within a school’s curriculum. Using the Guiding Definitions, VLP Standards, VLP Review Guide and VLP Rubric principles, administrators can support high-quality virtual instruction and make well-informed decisions that will help increase accountability and ensure consistency in virtual program evaluation. • Offer criteria-based evaluation tools to evaluate State Education Agencies (SEAs) current virtual programs, as well as virtual programs developed by vendors that they may be considering including as part of their curriculum. using online learning options. The survey also provided a forum for respondents to identify specific courses and academic services that they feel would be most beneficial to their students and staff if offered in an online learning environment. On September 14, 2011, in furtherance of potential for CBE, the New York State Education Department and the International Association for K–12 Online Learning (iNACOL), with support from Intel, sponsored the New York State Online and Blended Learning Summit II in Albany, NY. It included open and closing sessions by NYSED, a presentation by iNACOL on the state of online education in the United States, and panels on “Creating Educator Capacity for Online and Blended Learning” for Pre-service and In-service Teacher Education, In-service Teacher Professional Development, and Course/Instructor Evaluation in an Online Environment. The webpage for the Summit II (http://www.nyiteez.org/AlbanySummit/) contains videos and all files of the sessions, FYI. Supporters of CBE allege that there is a clear link between the new Common Core Standards, technology, online learning, and the rapid spread of “proficiency based learning”. Moreover, it is argued that friendly policies have passed at the federal, state and district level, making it possible to establish CBE programs in schools, programs and districts particularly thanks to changes in FERPA laws which allow for more free disclosure of student information without parent consent. pathways and approaches that others can study and potentially replicate state to state. Indeed, in 2011, the Bill & Melinda Gates Foundation created the Project Mastery grant program to support competency-based education initiatives in large school systems that serve a high proportion of disadvantaged youth. The grants supported the development and implementation of technology-enabled curricula, online learning management systems, and teacher professional development during the 2011–2012 and 2012–2013 academic years. The three recipient organizations—which included two large school districts and one intermediary organization—carried out their pilot programs in a total of 12 public secondary schools distributed across five school districts in four states. The Foundation asked RAND to evaluate these efforts in terms of implementation, students’ experiences, and student performance. The report presents final results from that evaluation and concludes with six lessons for policy, partnerships, and practice which presumably should be of interest to educational policymakers and practitioners interested in competency-based education models as an approach to K–12 education reform. The study was undertaken by RAND Education, a business unit of the RAND Corporation, on behalf of – who else – the Bill & Melinda Gates Foundation. Meanwhile, Common Core’s Achieve group urges States to adopt and implement CBE learning models. 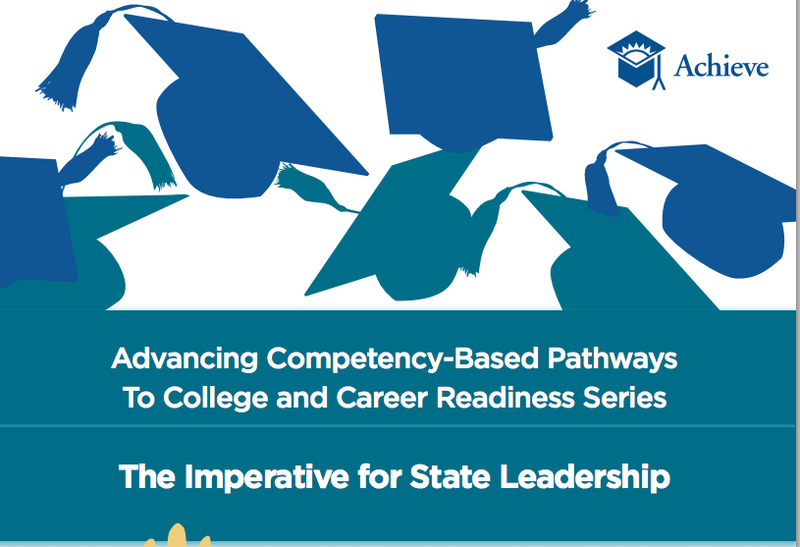 In 2014, Achieve issued an advisory to State leadership stating that Competency Based Learning pathways is an imperative in furthering the Common Core. How Can CBP Help More Students Achieve College and Career Readiness? It is essential that states have a clear and broadly shared understanding of how CBP could help them meet their collegeand career-ready goals and aspirations for students. Achieve has been hosting meetings on CBE for the past few years. They’ve created a working group that includes 11 states from the American Diploma Project and 11 organizations including NGA, CCSSO, and iNACOL. Achieve published policy guidance to states on assessments, accountability, and graduation requirements specifically advising Common Core states to implement Competency Based Learning models in public schools. In this era of federally mandated educational reform and concurrent state and local resistance to top-down government directives (e.g., the No Child Left Behind Act of 2002, the Common Core State Standards), a surprising consensus has arisen among state, local, and even federal education agencies in support of “competency-based” initiatives. Competency-based education (CBE) supports students’ progression through their academic work toward proficiency and mastery—regardless of time, method, place, or pace of learning (U.S. Department of Education [USDOE], n.d.). For the purposes of this publication series, a competency may be defined as “a combination of skills, abilities, and knowledge needed to perform a specific task,” which is tied to a specific goal or standard. As noted by Redding (2014b), competency entails a “general and evolving accumulation of related capabilities that facilitate learning and other forms of goal attainment” (p. 8); thus competency-based education stresses acquisition and demonstration of targeted knowledge and skills. Perhaps CBE garners advocates from all sides of the education debate because it fosters individualization and personalization (see Redding, 2014a, 2014c) while still requiring evidence of learning and accountability. So, is New York planning to “overhaul” education practices and reboot Common Core by adopting Competency Based Education? As set forth above, it would appear that NYS is well on our way to a CBE model or at least a strong variation of the same! According to the the iNACOL State Policy Frameworks, an important step toward CBE is for the state board and/or legislature to, “Redefine Carnegie Units or credits as competencies aligned to state academic standards.” The Great Schools Partnership, the same organization who issued the report on testing cited by the White House, has supported movement towards “proficiency-based diplomas” in Connecticut, New Hampshire, Maine, Vermont. Is New York next? Not everyone believes the CBE model is promising for public school students. A new study suggests that online courses could also widen achievement gaps among students in different demographic groups. 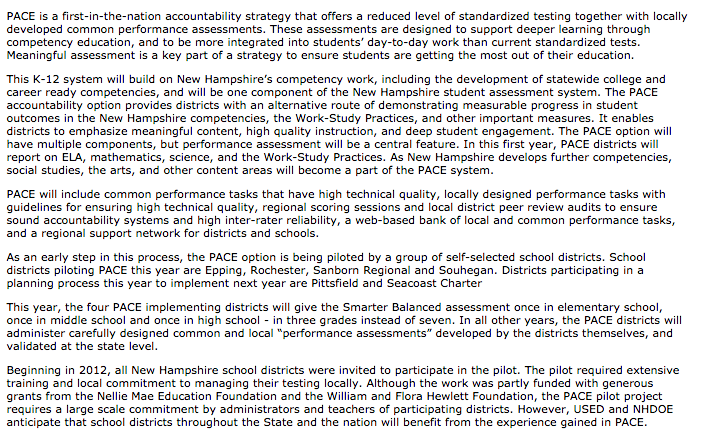 Maria Worthen, of iNACOL clarifies that New Hampshire, who adopted and implemented CBE via its PACE system, must continue to administer the SBAC in three grade spans to evaluate and validate the new system of assessments and this is far from “fewer assessments” actually. If assessments are not reduced, then what is the point? There are risks, however, that shifting to this approach could fail to further equity aims, worsen current disparities or create new ones. To mitigate these risks, states should take actions through whatever means are most appropriate for their context to address seven major risks (see sidebar). Some of these considerations are specifically related to CBP (such as pacing), while others also are critical in a traditional system. These issues are highly interrelated and should be considered as a whole. For example, standards, performance expectations and accountability have many common threads and interdependencies, as do learning, pacing, support and intervention, and effective instruction. to look at student work as part of good reflective practice and feedback loops/routines. In addition, teachers can create protocols to monitor and adjust expectations based on external review and feedback. Instructional roles can be separated so only external content experts grade/evaluate performance-based tasks. States also can leverage accountability and public reporting, incorporating additional measures that do not depend on teacher definition of expectations to identify disparities and make outcomes transparent (e.g., postsecondary enrollment and success rates). Another significant concern frequently cited is about how the unique needs of students with disabilities and ELLs will be addressed in a competency-based system. States should take great care to set policies and practices for their competencybased systems (or support districts and schools in doing so) with these students’ unique needs in mind, from instructional strategies such as direct instruction or small-group projects, to flexibility in demonstrating mastery, to specific supports needed in the classroom, to accommodations and modifications and other considerations such as pathways to graduation. development, particularly in techniques to assist ELLs and students with disabilities with demonstrating mastery of standards. It also is critical for states to consider the complex relationships among federal, state and district policy and practice and the law, regulations, guidance and funding streams for which each is responsible. In the mean time, as backlash over the Common Core continues, New York State is well on its way to adopting CBE and/or variations of the measure under the guise of conducting an “overhaul” of bad testing practices. Is the Cuomo Commission planning to “reboot” Common Core via CBE? CBE, to be or not to be? “Regarding Obama and the whole conversation around limiting testing – there won’t be less testing. The federal testing remains and now the feds will help the states implement the final blow – the testing that cannot be clearly seen or truly understood – like a stealth bomber – moving slowing and without sound through our public schools – and yes, engaging us – their enemy – as they blend in and take us out data point by data point until our public schools have vanished. The states will finally seal the deal in taking full ownership and full leadership in destroying their own public schools. A few years from now folks will look around at the destruction, the charter schools with 150 kids in a classroom being facilitated by a person with no teaching experience and/or REAL teaching degree – folks will wonder – how did this disaster occur? How did we not see it happening? Folks will say….but I thought they were with us ?? No. They were never with us. Never. The privileged and the powerful will not stand with The People. It would defeat their entire purpose in being – to maintain and preserve and INCREASE their power and privilege. Revolution continues to be the only answer. If the test and punish system remains in any shape or form – then the structure remains for them to move silently forward with a new paradigm shift that will appear – at first – almost invisible to the public. Any sort of weak stance on our part that accepts any part of their plan allows them to move more quickly. The current federal dept. of ed. mainstream media testing campaign – which is occurring just in the nick of time – to support the peer reviewed state testing system process, is their latest attempt to cause us to hope and be appeased. New Hampshire – The state is initiating high school redesign that replaces the time-based system (Carnegie unit) with a competency-based system focused on personalized learning, strong teacher-student relationships, flexible supports, and development of 21st century skills. Michigan Seat Time Waiver –Michigan passed legislation in 2010 providing a seat time waiver to districts that want to offer pupils access to online learning options and the opportunity to continue working on a high school diploma or grade progression without actually attending a school facility. Additional links here and here. Ohio’s Credit Flexibility Plan – This plan, adopted by the State Board of Education in 2009, allows students to earn high school credit by demonstrating subject area competency, completing classroom instruction, or a combination of the two. Under this plan, subject area competency can be demonstrated by participation in alternative experiences including internships, community service, online learning, educational travel, and independent study. Chugach School District – This rural Alaska district developed a performance-based learning system by creating, implementing, and fine-tuning thematic units, tools, assessments, and instructional approaches, and replacing replace the Carnegie unit and grade levels with 10 performance levels. This system lead to the creation of the Re-Inventing Schools Coalition (RISC) model, a standards-based approach to learning that is not tied to seat time, is flexible, and promotes student ownership over learning. The RISC model is currently in use in 16 districts and schools across the country. Additional link here. Adams County School District 50 – This rural Colorado district has implemented the RISC model and created a system of learner-centered classrooms by replacing grade levels with 10 learning levels that students work through at their own pace. This approach is designed to give students the time and help they need to reach the standards at one level before advancing to the next. Additional link here. Big Picture Learning School – This model seeks to provide a personalized learning experience that challenges and supports students, engages families in the learning process, and encourages students to take ownership over their own education. Each student works with an academic advisor and their parents to develop an individual learning plan that addresses their needs, skills, and interests. Young Women’s Leadership Charter School – This Chicago school has moved away from tying credit to seat time and instead awards credit for specific competencies demonstrated at any point in a student’s high school career. Students earn credit for classes in which they demonstrate proficiency on at least 70 percent of academic course outcomes. Diploma Plus – This model is a student-centered high school alternative for youth who are over-age and under-credited, re-entering high school, or placed at risk of dropping out. The goal of this school is to graduate students ready for college or career by enhancing student engagement and college and career preparation, and creating positive learning experiences for students. Diploma Plus works in partnership with school districts and communities in seven states. Communities in Schools’ Performance Learning Centers – Communities in Schools has developed Performance Learning Centers to serve students who have fallen behind in credits. These alternative high schools are designed to help students earn credit and graduate on time by providing them with a rigorous academic environment, self-paced curriculum, project-based learning, and flexible schedules. Some college leaders say that by focusing on what people learn, not how or when they learn it, and by taking advantage of the latest technology, they can save students time and lower costs. It is also reported by reformers that CBE will increase learning and lower costs. as education is redefined as a “place” to a bundle of student-centered,outcome d riven services. 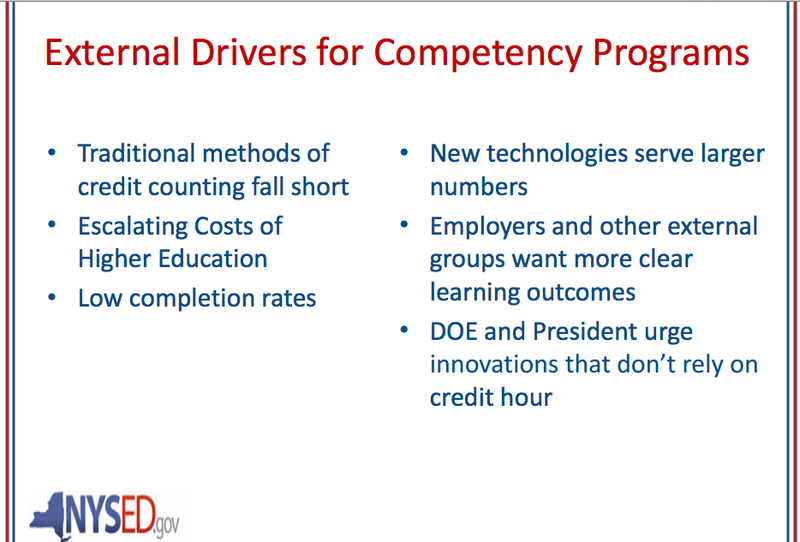 Next > Competency Based Ed- the culmination of the common core agenda.